Obama had his religious nutter (Rev. Wright) and now McCain seems to have his own in the form of John Hagee, the televangelist and pastor for a Megachurch in San Antonio, TX (Cornerstone) was heard to state “biblical verses made clear that Adolf Hitler and the Holocaust was part of God’s plan to chase the Jews from Europe and drive them to Palestine” [this quote is from this NY Times article, not Hagee directly]. The articled linked in the previous sentence goes in to far more detail and you’ve probaby already heard it all anyway. But what I wanted to make note of was a new book that you might not know about. Written by Matt Taibbi, The Great Derangement [Amazon.com] is a first-hand account of an atheist who goes “undercover” with a church-group to a boot camp for new converts, encountering all sorts of madness, nutty behavior, and characters both scary and delightful along the way (mostly scary, it would seem). In an excerpt, which you can read here [Alternet.org], Taibbi shares his observations getting on the bus to go to the boot camp and with members learning to speak in tongues while pretending to get the holy ghost. The excerpt is short and there are a host of comments defending either Taibbi & atheists or Hagee & religious nuts. This entry was posted in Christianity, Culture Wars, Superstition and tagged atheist, hagee, holy ghost, taibbi. Bookmark the permalink. I read the online excerpt from Taibi’s book. A lot of religious fervor is based on emotion and shared experiences with others. That’s why religion appeals so strongly to the emotionally and socially needy. I’m not saying that all believers are emotionally or socially warped – in fact, most are not, they are simply raised in traditions that they carry on – but some believers find connections in churches that they don’t get anywhere else. I am mature enough to say and write this: I love Pastor Hagee. He is a good man and his family is good people. Ps I vote democrat and I am a chistian. What that fool did was blasphemy and an embrassment to the people who need help. Someone is about to pour their heart out for healing and you are going to say some dumb stuff like your father was a cown? Also the words you used to describe black people shows your arrogance. I reviewed my words and that of the few comments, and I don’t see any description of black people or “your father was a cown (or “clown?”). Perhaps you have the wrong blog? 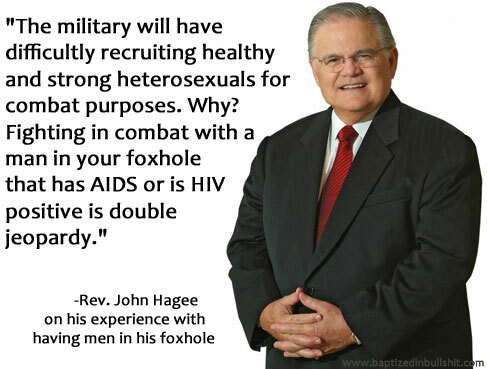 Hagee is nuttier than a fruitcake.